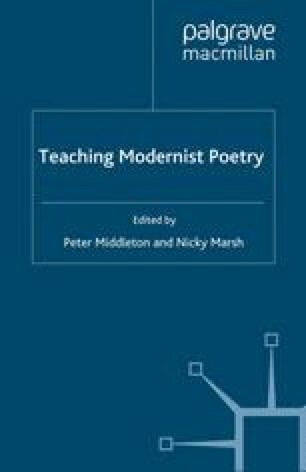 The pedagogies of modern literary studies and the practices of modernist poetry have shared a long history. Pound and Eliot may have dreaded the ‘deadening’ life of the academic but the explication of their writing was at the core of the teaching practices that came to dominate the academy for over half a century (McDonald, 1993: 43). ‘New Criticism and modernist poetry were’, as Alan Golding notes, ‘almost literally made for each other’ and the institutionalisation of literary studies that took place in the early years of the twentieth century took many of its cues from the emerging principles of high modernism (Golding, 1995: 75). These pedagogical forms were exemplified by the Practical Criticism of I. A. Richards and given ideological elaboration by the writing of the Leavises in Britain and of the New Critics in the US. The assumptions supporting this teaching practice were ubiquitous, pervasive, and are still familiar: the close and active reading of the difficult text is a redemptive act, uniquely able to withstand the deforming pressures of an increasingly powerful technocratic and industrialised mass culture. By the early 1950s such assumptions had become commonplace and standardised. ‘Every poem’, John Guillory asserts, becomes an ‘image’ of the ‘institutional space in which it is read’, a means of alerting its well-trained readers to the fact that ‘the retreat of literary culture into the university’ is a ‘transcendence of the conditions of modernity’ (Guillory, 1993: 165).